There’s little I like more than a Bank Holiday. The long weekend, the subsequent shorter working week, the extra lie-in and the family time, all subscribe to perfect. I sometimes get that weird comparison thing we’re not meant to admit to though, when it feels like everyone else in the world – or on Facebook and Instagram at least – are taking a million exciting and interesting family trips. Generally I’m just glad of the extra parent for a day, the chance to relax (a little bit), and the opportunity for us to do a couple of boring but essential jobs around the house. We don’t have the spare money for anything especially fancy, and even if we did, the baby doesn’t nap well out and about and sleeps worse than a newborn at night which leaves me a bit broken some days. I know children love experiences and rely on their parents to provide them – when they are young at least. But the memories I have of my childhood aren’t ever of doing anything fancy. We didn’t eat out at themed restaurants or take oodles of exciting day trips to theme parks or science museums. I remember playing in our garden in the paddling pool, and on hot days having fish finger dinners outside, the plate balancing on my knee as I sat on the grass with ketchup fingers. We climbed trees with friends and went to the park all the time without it ever being boring, and spent hours sat on the PO Box spotting cars. I went on bike rides with my mum and made perfume with my sisters from rose petals which we tried to sell to passers-by – wholly unsuccessfully of course. Perhaps there have always been a million places to visit or must-have day trips to experience, and I just didn’t know about it. I never felt I was missing out at all though. I’m sure that things have ramped up a gear or two since the ‘80s however. Now there seems to be an expectation that most weekends involve doing something or going somewhere and oh, aren’t there so many places to choose? There’s the planning, travelling, entrance fees, meals – all in the name of something fun and educational which ticks a good parenting box. And family experiences are lovely, but they shouldn’t take energy and funds we don’t have, and we shouldn’t feel like our kids are missing out if we don’t do them regularly. At their current ages, my kids are as happy with a trip to the park or woods as anything else. They want to spend time with us, be fed and watered and they need downtime at home as well. My just turned four-year-old does still talk about the mini theme park we went to for his third birthday – where he refused to go on all but two rides I might add – and I love that he has this happy memory of doing something special and different. But we can’t do stuff like that all the time, and if we did, it wouldn’t be special and still talked about a year on. Plus, we are fortunate that we get to go away on holiday, where with the equation of work and house drudgery removed for a week, we are free to do nothing but ‘hashtagmemorymaking’ – along with the odd bit of bickering and a few ice cream binges. I’m starting to realise it’s just not necessary to do a lot of the cool and expensive stuff, and there’s nothing wrong with simple weekends or being low-key. The fact is life is busy. And as much as I genuinely love the younger years with our children, most days are pretty chaotic. I literally forget what we are meant to be doing sometimes, I often don’t get chance for a shower, and I have my work cut out just answering eleventy billion ‘why’ questions, failing to get on top of the washing, making dinner every day and keeping them both alive. The above are my must-haves right now – a trip to the space museum doesn’t feature on the essentials. And the truth is the four of us are probably happier at weekends doing what we need to do, along with enjoying a bit of time out and catching up with family, friends and sleep. I know that sorting the spare room, buying a kettle and walking to the park really isn’t the most exciting of answers to the ‘what did you get up to this weekend?’ question. But it’s the honest – and right one for us most of the time. My childhood was happy and fun, and though I look back fondly at my few family ‘experiences’ – like my dad instructing four-year-old me to tell the attendant I was three as we queued for Alton Towers, or running along the balconies outside our Butlins chalet with my cousins, my feelings are the warmest on the streets surrounding my childhood home. Spotting tadpoles in the little brook, calling round to friends’ and playing on our bikes until the sun began to set and our stomachs rumbled. The little rituals like our mum buying a paper bag of Thornton’s Toffee to share between the three of us after swimming on a Thursday, and playing cards as a family with buttered toast and my own pile of pennies. It wasn’t that I had some perfect childhood or family by any means, and I also remember the boring monotone of background Sunday horseracing on the telly, and my dad insisting on watching Fifteen to One after school instead of cartoons. But being bored was good for me too – and man, who wouldn’t love the chance to be bored right now? So whatever you did with your Bank Holiday weekend, if it doesn’t seem Instagram worthy and was absent of a cool Facebook check-in, remember there’s nothing wrong with pottering and staying local. And probably a lot of good about recharging, spending a bit of time together and finally replacing that 12 year old rancid kettle*. *Potentially overly specific reference, but author maintains the importance of a decent cuppa as a parent really should never be underestimated. 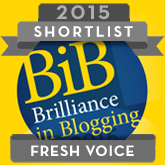 If you have two seconds, OK two minutes, I would be most grateful for your nomination in Readers’ Choice at the Brilliance in Blogging Awards – just click below – thank you!